Andy Friend makes ten changes to his team for the clash at the RDS. CONNACHT HEAD COACH Andy Friend has made ten changes to his side for Saturday’s visit to the RDS to take on Leinster [Kick-off 7.45pm]. 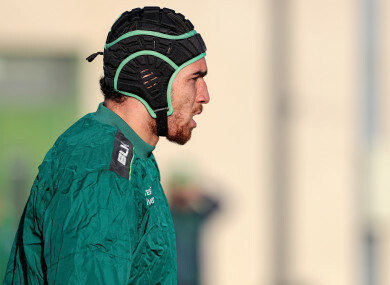 Returning to the starting team are internationals Finlay Bealham and Ultan Dillane, while Bundee Aki makes the bench. Aki only returned to Galway on Tuesday after getting married in New Zealand last weekend. Bealham comes into the front row alongside Denis Buckley and Tom McCartney, while Dillane will line up alongside Gavin Thornbury in the second row. Jack Carty and Caolin Blade renew their partnership at half-back. Replacements: Shane Delahunt, Peter McCabe, Dominic Robertson McCoy, James Cannon, Eoghan Masterson, James Mitchell, David Horwitz, Bundee Aki. Murray Kinsella, Gavan Casey and Andy Dunne preview another big weekend of rugby action and dissect the week’s main talking points. Email “Aki, Dillane and Bealham return to Connacht squad for trip to Leinster”. Feedback on “Aki, Dillane and Bealham return to Connacht squad for trip to Leinster”.